A correct sitting posture is important for child especially in the growing period. IKAYAA child study set is designed to provide a more comfortable learning environment for children. 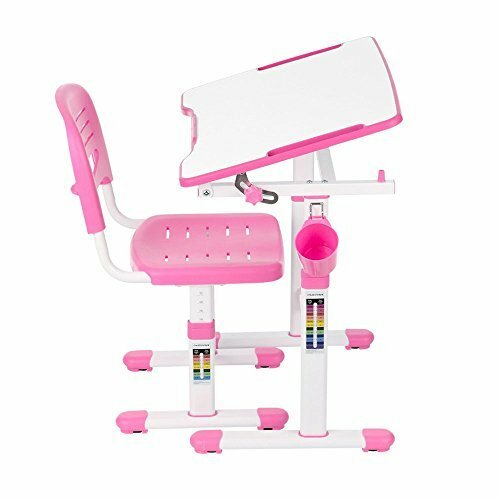 Both desk and chair are height adjustable to suit the growth of your child. And table top is 0-40°tiltable for writing, drawing etc. Made of high quality metal and plastic, it is stable and durable for long use. Good study set your child cannot miss features: Space-saving to put them in children's room. Ergonomic design to help children have a healthy sitting posture. Specifications: Material: Metal + plastic + mdf color: Pink / blue / grey (optional) table size: 66 * 46.5 * 54-76cm / 25.98 * 18.31 * 21.26-29.92in (w * d * h) chair size: 35.5 * 37 * 32-44cm / 13.97 * 14.56 * 12.6-17.32in (w * d * h) product weight: 13.8kg / 30.4lb package size: 73.5 * 53.5 * 21cm package weight: 15.8kg / 34.8lb package included: 1 * table 1 * chair.